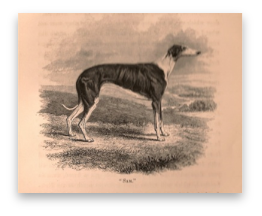 Dogcrazy: Book Grading - How Much is a Book Worth? Before reading this section, please refer to the article on rarity, scarcity and condition for other terms we apply when grading our books. 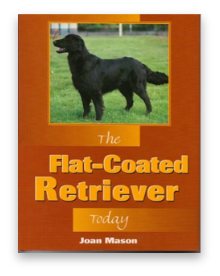 Here are the standards we use at Dogcrazy Books along with some examples to illustrate it for you. NEAR FINE: Almost fine, but with a couple of minor defects. 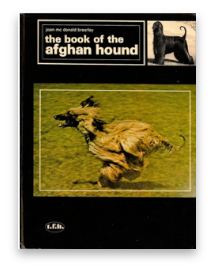 The only defect in this copy of The Book of the Afghan Hound is the laminate coating which is peeling on the lower spine. VERY GOOD: A used book that shows some type of wear. The corners may be bumped or there may be scuffing or minor soiling. All pages and plates are included and binding is tight. Pages are clean and unmarked. Both of the books below are in very good condition. 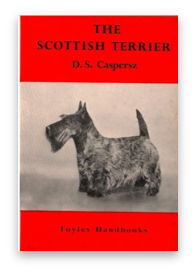 The Scottie book shows minor wear to the corners and the Vizsla book shows some scuffing to the photo on the cover as well as minor wear on the spine. GOOD: Your average used book which shows signs of wear. 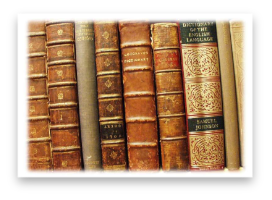 Despite the word "good," the normal good book is not in particularly good condition. It may show significant wear with bumped corners where the cloth is frayed away exposing the boards. There may be fading to the cover or spine or soiling or staining on the cover. There may be marking on the pages, but not so much as to interfere with reading or appreciating the illustrations. 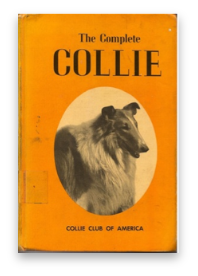 This copy of The Complete Collie is an ex-library book. You can still see the tape which was used to secure the tag giving the Dewey decimal number. The corners are also bumped and there is some staining and soiling on the cover. 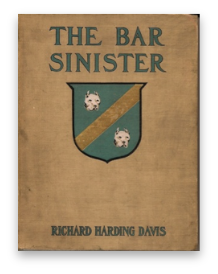 This copy of The Bar Sinister, published in 1906, shows considerable soiling to the covers. The corners show significant bumping. 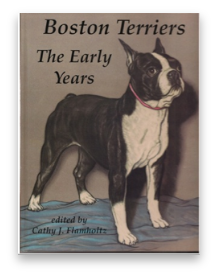 The shield on the front still shows its gilt marking and the Bull Terrier heads are still in great shape. FAIR: A very worn book. All the normal pages containing text are complete, but the title page or endpages may be missing. The binding is intact but may be tenuous. Sadly, this copy of Champion of Champions, the story of Ch. Nornay Saddler, is in only fair condition. 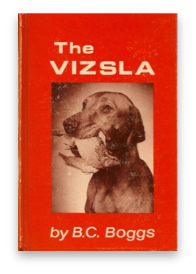 While the pages and illustrations are all intact, the cover shows wear and soiling, the top 1/2 inch of spine is missing, the cloth is frayed from the bumped edges and, most notably, the top corner bears the teeth-marks of my first Weimaraner. POOR or READING ONLY COPY: A book showing a great deal of damage that's really only good for reading. 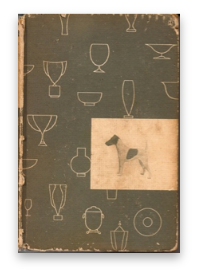 The text is all there, but the binding is probably detached or very loose. Some of the plates may be missing. 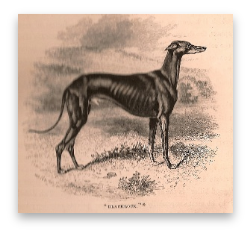 This copy of the very rare book, The Greyhound, by Stonehenge is in poor condition. The binding on this 1853 book is completely separated from the text pages. 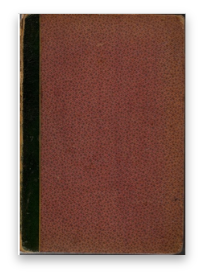 While it shows significant wear, it is the condition of the binding that earns it a rating of poor (continue below). 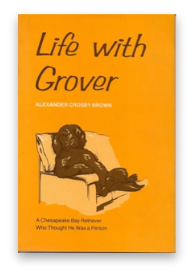 Usually books in poor or reading copy only condition have little value. Most dealers will probably just toss a newer book in this condition. Whether they sell the book, at a reduced price, depends on the demand for copies. The Stonehenge, pictured above, is a rare item so has retained a portion of its value. In addition to the early text, it features a number of plates with exquisite drawings (see below). Sadly, this tempts some dealers or buyers to remove the plates and sell them individually because they are worth more on their own. That makes those of us who love books shudder.